The road to the Minamata Convention on mercury took almost 15 years and has been significantly influenced by Arctic research and Norwegian efforts. Why and in what way did Arctic research play such a significant role in this road towards the convention? It is generally recognized that environmental politics should be based on robust science-based knowledge. But how does science and scientific experts contribute to policy in practice? - We need more knowledge about the role of scientific experts in political processes, so that scientific research can be integrated more efficiently in politics, says Froukje Maria Platjouw and Eirik Hovland Steindal (Norwegian Institute for Water Research, NIVA), and Trude Borch (Akvaplan-niva). - This is especially true for environmental legislation. The pathway to multilateral environmental agreements often takes many years, despite the urgent nature of many environmental issues. In a recently published article in the scientific journal Arctic Review on Law and Politics, the researchers from NIVA and Akvaplan-niva analyse the process that lead to the international convention on mercury, the Minamata Convention. Their intention is to draw attention to the question of how scientific research is integrated in environmental politics and how it could contribute more efficiently to negotiating processes towards international conventions. The Minamata Convention on Mercury was signed in 2013 and entered into force on August 16th 2017. Arctic research and the active role of AMAP were important contributions to the international agreement on mercury. The Minamata Convention on Mercury aims to protect human health and the environment from anthropogenic releases of mercury. Health effects from long-range transported mercury is evident in Arctic wildlife. Illustration: Tempelfjorden in Svalbard. Photo: Torunn Slettemark Hovden. - There were four factors that made Arctic research an important contribution for the global agreement on mercury: priorities in national politics, involvement of experts, timing, and funding, says Platjouw. - Through its working group AMAP, the Arctic Council had a key role to add and keep the mercury problem on the agenda, and also in the process towards international negotiations, says the NIVA researcher. The Arctic Council is the leading intergovernmental forum for the Arctic countries, and AMAP (Arctic Monitoring and Assessment Program) is one of the six working groups of the Arctic Council. 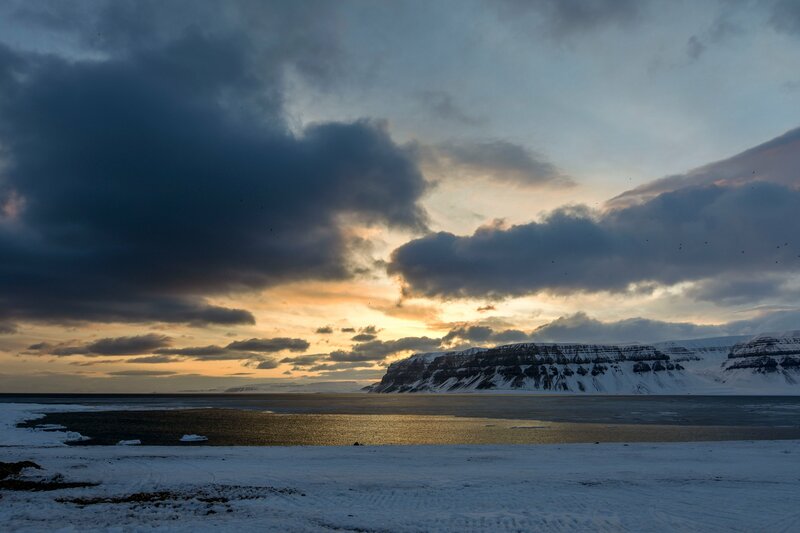 AMAP monitors and synthesizes research on the Arctic environment, and provides scientific advice to governments about pollution and climate change. When UN Environmental Programme (UNEP) decided to work towards a legally binding instrument on mercury in 2009, AMAP had already built a solid knowledge base and published several comprehensive reports on the negative effects of mercury. - The fact that AMAP had already built strong scientific evidence liberated resources for negotiating solutions to reduce mercury emissions, rather than disputing the scientific aspects of mercury, says Platjouw. AMAP became a data supplier, communicator, and broker of scientific knowledge in the international negotiations. - Later, during the negotiations on whether the agreement should be binding or not, the attention of the AMAP reports was on the global emission sources, which underlined the importance of an international legally binding agreement. Whether the strategy was planned or not, several AMAP reports were published at important times in the process. The reports also included policy oriented scientific advice, some of which compromised national politics in several of the Arctic Council member states. Scientific research may influence politics, but politics also determines the type of research that is funded. The funding system for research influences both the research fields being funded, and the way research will be communicated to society and decision makers. The Nordic Council of Ministers funded the first AMAP report (1997-1998), one UNEP report, and gave economic support to AMAP research on mercury. Hence, the Nordic countries’ contribution to building a knowledge base was substantial. As a member of both the Arctic Council and the Nordic Council of Ministers, Norway was among the countries that worked through several channels to influence the process towards a legally binding instrument. Initially, Norway would not push for such an agreement due to possible internal conflicts among the Arctic Council member states. Instead, Norway and Switzerland urged the need for a legally binding agreement to UNEP. This proposal was supported by the EU and Russia. Waiting for other Arctic Council member states, such as the US and Canada, to agree on the proposal could have further delayed the process. - Whether the Minamata Convention is the result of strategic planning from certain member states in the Arctic Council or the AMAP secretary or rather the result of dynamic development in line with global policy development on mercury, remains an open question. There is however no doubt that Arctic research and the active role of AMAP were important contributions to the international agreement on mercury. Norway and the Nordic countries got good value for the resources canalized through AMAP, finishes Platjouw. The article «From Arctic Science to International Law: The Road towards the Minamata Convention and the Role of the Arctic Council» is written by researchers from NIVA and Akvaplan-niva. The project was funded by the Fram Centre’s flagship ‘Miljøgifter- effekter på økosystemer og helse’. • Mercury is a naturally occurring metal, but anthropogenic activity has led to additional emissions and high environmental concentrations. The metal is transported great distances across the globe with atmospheric transport and water currents, and concentrates in the Arctic food chain. • The global convention on mercury is named after the city Minamata in Japan, where more than 1 000 people died following a mercury release in 1956 that polluted fish and shellfish. Ingestion of mercury-containing foods lead to toxic effects in the central nervous system and severe malformations. PLATJOUW, Froukje Maria; STEINDAL, Eirik Hovland; BORCH, Trude. From Arctic Science to International Law: The Road towards the Minamata Convention and the Role of the Arctic Council. Arctic Review, [S.l. ], v. 9, p. 226-243, aug. 2018. ISSN 2387-4562. Available at: https://arcticreview.no/index.php/arctic/article/view/1234. Date accessed: 03 oct. 2018. doi: https://doi.org/10.23865/arctic.v9.1234.